The birth of the first stars is one of these important moments in the history of the universe, says Robert Simcoe, Associate Professor of Physics at MIT. "It went from looking like the early universe, which was just gas and dark matter, to looking like it does today, where there are stars and galaxies … it's the point when the universe started to resemble what it looks like today. And it's sort of amazing how early that happens. It didn't take long." Researchers at MIT, the California Institute of Technology, and the University of California at San Diego have peered far back in time, to the era of the first stars and galaxies, and found matter with no discernible trace of heavy elements. To make this measurement, the team analyzed light from the most distant known quasar, a galactic nucleus more than 13 billion light-years from Earth. These quasar observations provide a snapshot of our universe during its infancy, a mere 750 million years after the initial explosion that created the universe. Analysis of the quasar's light spectrum provided no evidence of heavy elements in the surrounding gaseous cloud—a finding that suggests the quasar dates to an era nearing that of the universe's first stars. "The first stars will form in different spots in the universe … it's not like they flashed on at the same time," says Simcoe. "But this is the time that it starts getting interesting." Simcoe and his colleagues have published the results from their study in the journal Nature. Based on numerous theoretical models, most scientists agree on a general sequence of events during the universe's early development: Nearly 14 billion years ago, an immense explosion, now known as the Big Bang, threw off massive amounts of matter and energy, creating a rapidly expanding universe. In the minutes following the explosion, protons and neutrons collided in nuclear fusion reactions to form hydrogen and helium. Eventually, the universe cooled to a point where fusion stopped generating these basic elements, leaving hydrogen as the dominant constituent of the universe. Heavier elements, such as carbon and oxygen, would not form until the first stars appeared. Astronomers have attempted to identify the point at which the first stars were born by analyzing light from more distant bodies. (The farther away an object is in space, the older it is.) Until now, scientists have only been able to observe objects that are less than about 11 billion years old. These objects all exhibit heavy elements, suggesting stars were already plentiful, or at least well established, at that point in the universe's history. "[The astrophysics community] sort of hit this wall," says Simcoe, also at MIT's Kavli Institute for Astrophysics and Space Research. "When this [quasar] was discovered, we could sort of leapfrog further back in time and make a measurement that was substantially earlier." The quasar in question, discovered in August 2011, is the most distant of its kind. To study such distant objects, Simcoe and his colleagues built an infrared spectrometer, which they fitted onto the Magellan Telescope, a massive ground-based telescope in Chile. This past January, the team trained the telescope on the newly discovered quasar, and collected data from its light. The spectrometer split the incoming light into different wavelengths, which the team plotted on a graph. Simcoe then looked for telltale dips in the data, correlating various wavelengths with the light given off by different chemicals. "Each chemical has its own fingerprint," Simcoe says. "Based on the pattern of what light is absorbed, it tells you the chemical composition." Simcoe and his colleagues determined the quasar's "intrinsic spectrum"—the amount of light naturally given off by such a body—and compared this with the observed data to search for the presence of heavy elements. The group found evidence of hydrogen, but no oxygen, silicon, iron or magnesium in the light data. But confirming the absence of evidence for heavy elements was a challenging task. "It's always hard to establish the absence of something," Simcoe says. The researchers considered every other scenario that might explain the light patterns they observed, including newborn galaxies and other matter situated in front of the quasar. Their efforts ultimately confirmed that the quasar's light spectrum indicated an absence of heavy elements 750 million years after the Big Bang. Going forward, Simcoe hopes to analyze other quasars from this early era to further confirm the absence of heavy elements. "If we can find things in this epoch, we can start to characterize them," Simcoe says. "There's always something interesting at the edge." Journal reference: Nature. 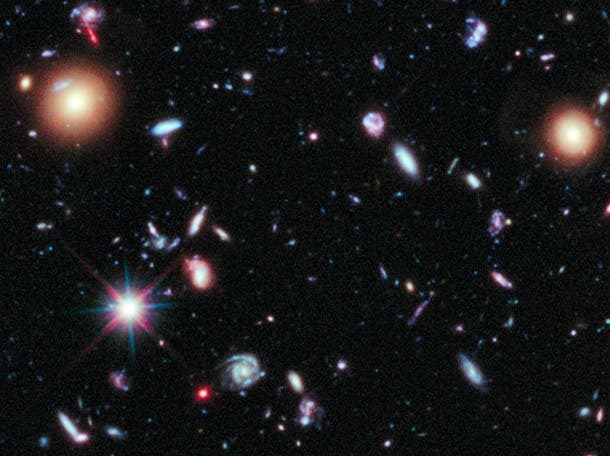 The image at the top of the page is a detail based on the original Hubble Ultra Deep Field, with new observations added in since the originals were done. It shows over 5500 galaxies. – an island universe of billions of stars- in a small region of space in the constellation Fornax, composited from Hubble Space Telescope data accumulated over a period from September 24, 2003, through to January 16, 2004, looking back approximately 13 billion years (between 400 and 800 million years after the Big Bang). The Daily Galaxy via Massachusetts Institute of Technology.